Our gracious hostess and talented instructor, Rachelle, demonstrated for us. Yesterday was a really cloudy and overcast day. It certainly did not feel like spring. Thankfully I was able to play with flowers and hang with lovely ladies. 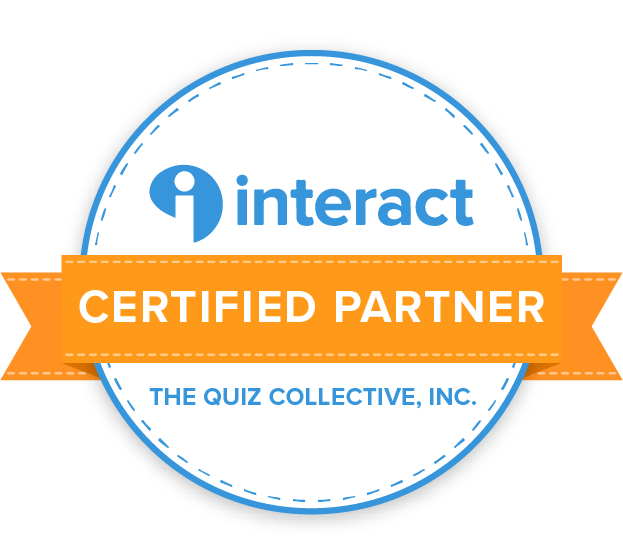 I am excited to share what I learned with you. This is my bouquet after I cut away the plastic. I am ready to arrange now. Notice my blue plant food packet and my rocks at the bottom of my vase. 1. 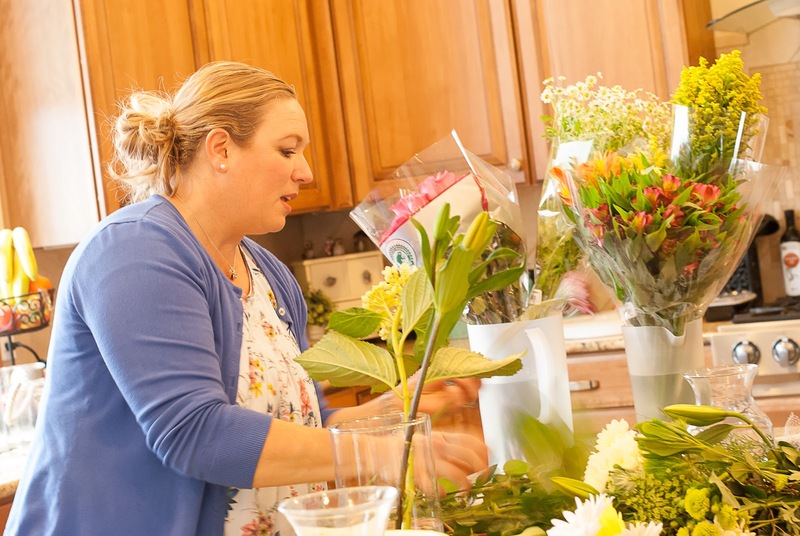 Flowers: We used mixed bouquets from local grocery stores…Costco, Sam’s Club and Pick n Save. I spent $11 on a bouquet called “Spring Delight”. Mine was a bit too small, but there were plenty of affordable bouquets that could have worked well, and you could buy a small bouquet of filler flowers, greener or twigs too. For roses feel the base of the petals and if they are firm you know that it will last longer. It is okay if some of the guard petals on roses are a little wilted because you can pinch those off. Also check the health of all the petals and leaves of the flowers. Don’t get a bouquet that will not last and if it is not looking good, it should be discounted. 2. Vase: The ones with a neck at the top are best so that you can flair the flowers. 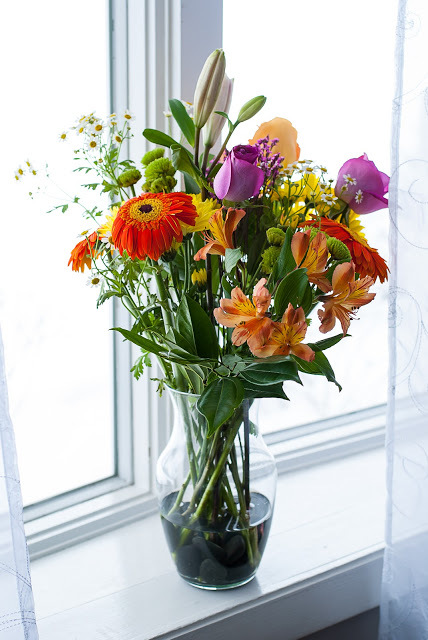 If the vase does not come together more at the top, you will need more flowers to make the arrangement look full. You can get vases anywhere, but you buy based on the type of arrangements you want to buy. If you want to put a few flowers that your child picked for you, buy small short vases. 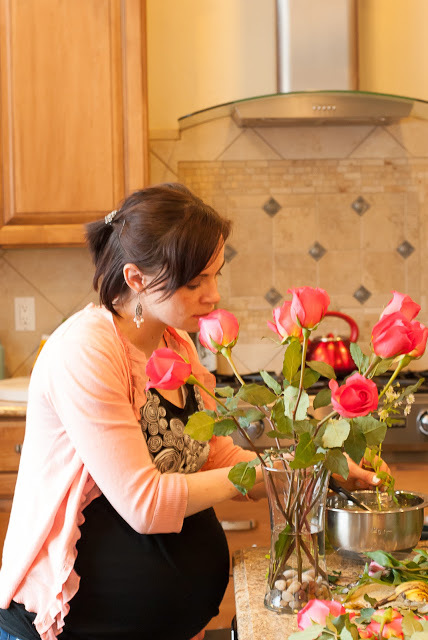 You will need a larger vase for a bouquet of roses from your husband. 3. Rocks: It is great to have some rocks at the bottom that will help keep the stems in the place that you intend. You can get a large bag of rocks at the dollar store. They also look pretty at the bottom of your vase. When you are done with the rocks, wash them with dish soap, let them dry and then store until you need them again. They will likely be pretty slimy after your bouquet is done. 4. 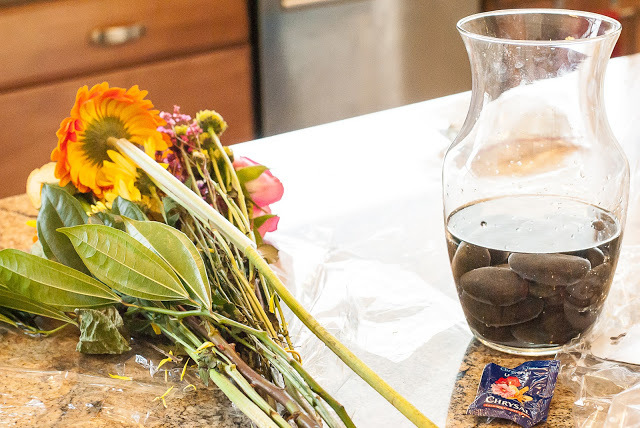 Add water and the plant food that came with your bouquet. When you are at the florist, ask them for a few extra plant food packets and they will usually give them to you. Change your water when it starts to get murky. 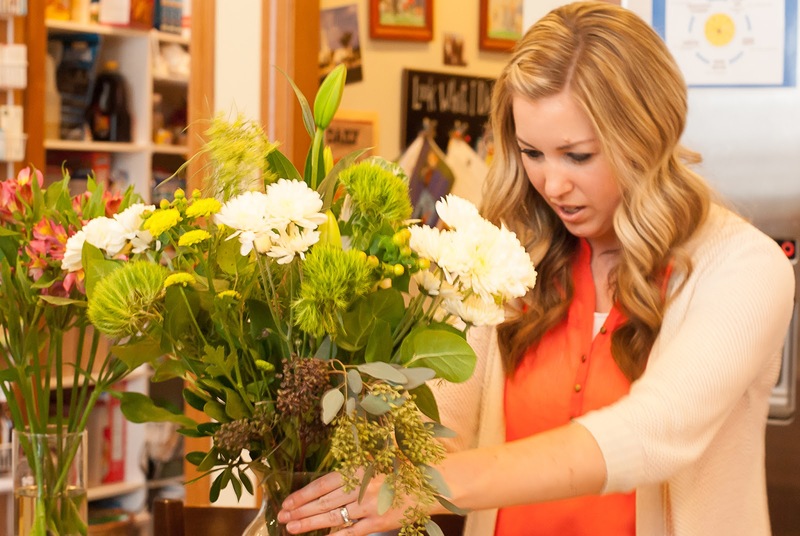 Carefully remove the bouquet so that you can just put it back in just the way it came out. 5. 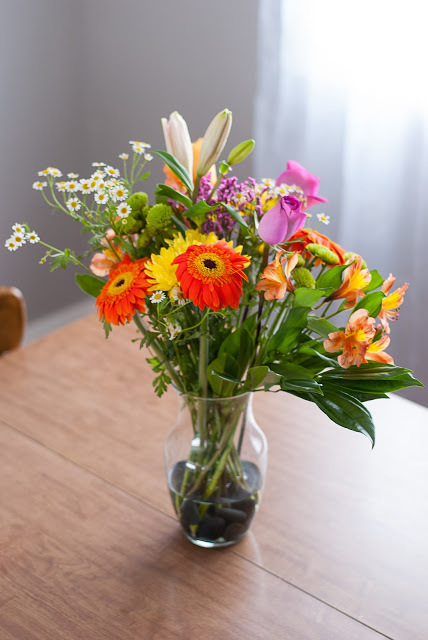 Flower clippers: Because some flowers have woody stems that are too hearty for regular scissors, it is best to have clippers- the dollar store also have some. Remember that you would need wire cutters for fake flowers. I will have a few notes on fake flowers later. 6. Bowl of water: This is super important and something that I did not realize. If you cut the stems of your flowers without submerging them in water, pockets of air with get into the stem and they will wilt faster. Always cut your stems under water…filtered water is best. 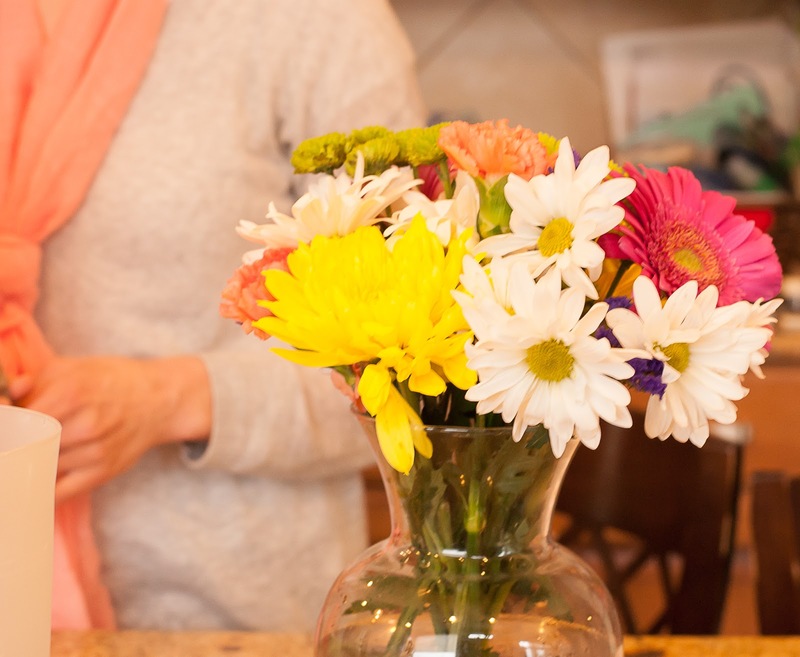 The water should be room temperature or colder because warm water opens up the flowers. This is a short bouquet. My friend does not like how the taller bouquets get in the way of her line of sight. 1. Cut your stems diagonally at the bottom(under water)–this creates more surface area to work with. 2. 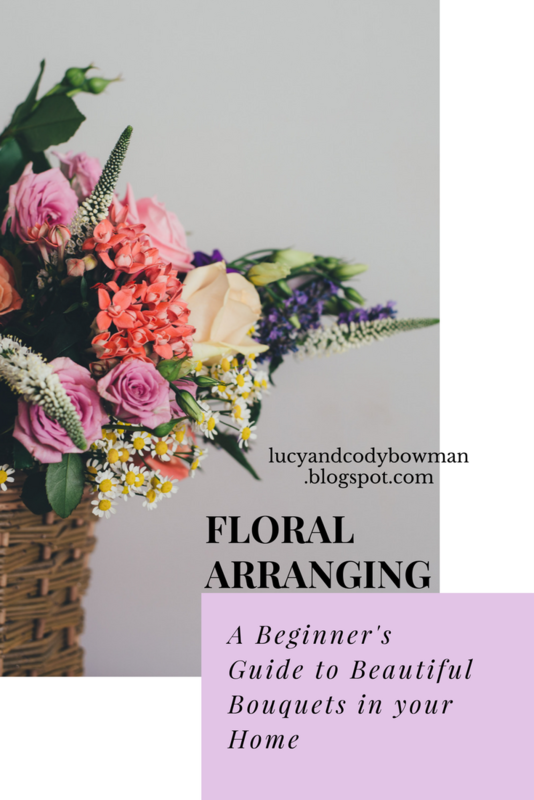 You will start with the piece that you want in the center; you don’t want a flower that makes the arrangement look top heavy. When my lilies opened I needed to re-arrange where they went in they went. The rocks will help you keep the flowers steady when you first begin. 3. Then you add a flower on the side and make sure it is cut so it sits lower than the center flower. 4. Even out the opposite side with the same flower and/or same color at a similar height. You will put in the flowers so they cross at the bottom and help to prop each other up and stay in place. 5. Now rotate the vase a little and begin filling in the next open side. 6. Even out the opposite side and continue adding flowers. 7. Pay attention the the height of the flowers. 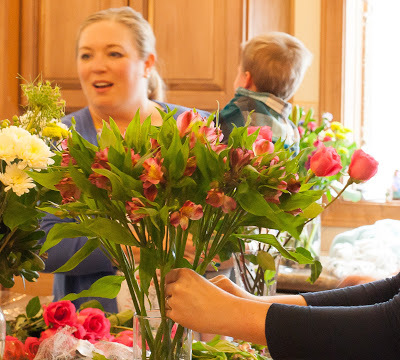 Make adjustments so the flowers are not at the same exact level. Your goal is to create height and depth to the arrangement. 9. Take a last look and make adjustments so their is balance and depth to the arrangement. 10. Great job! Now place your arrangement somewhere you can enjoy your flowers. Notice how her stems are crossing at the bottom and they are being placed in the rocks to keep them steady. Previous Post: « Keeping Up with Jane…my six year old!